Negative pressure systems have exhaust fans that blow air out of the building, creating a slight negative pressure (vacuum) to draw air into the building through designed inlets, while positive pressure systems have fans that blow air into the building creating a slight positive pressure. Air exits the building through exhaust openings. Air distribution ducts or fan baffles are used to reduce drafts and provide fresh air uniformly throughout the building. Neutral pressure systems have features of both negative and positive pressure systems. Fans blow air both into and out of the building. Static pressure is defined as "the pressure exerted by a still liquid or gas, especially water or air." This simply relates to the occurrence of a slight decrease in pressure within a building relative to outside air pressure when one or more exhaust fans are turned on. It is important that we understand this concept because the use of exhaust fans, or negative pressure ventilation, is the most common form of power ventilation. Negative pressure ventilation is also the easiest and most efficient method to control air exchange. Static pressure is important because maintaining proper negative pressure allows air to enter the building at the right direction and speed for mixing with air already inside. Cold air entering through cracks, curtains or vents is heavier than the inside warm air. If it does not shoot into the room with sufficient speed, this incoming cold air will immediately fall downward along the sidewalls and end walls. That is why drafts of air often feel cooler in these areas of sub-optimally ventilated buildings. In buildings under proper static pressure, there will be fewer cold spots, fewer dead air pockets and no drafts at livestock level. Static pressure is expressed as the difference between inside and outside air pressure in inches of water column (wc), and is measured with a manometer. Air must be controlled as it enters the building. This is best achieved by mounting rectangular vent boxes along the upper part of sidewalls that automatically adjust to variations in negative pressure. Proper installation of vent boxes will direct the incoming air slightly upwards where it will mix with warmer air and gently fall to correct level. Adjust building inlet area to number of cubic feet per minute (CFM) of air being moved by the fans. Under most circumstances, static pressure should be maintained between 0.05" and 0.08" wc. This may require sealing cracks and crevices to reduce the amount of air entering the facility. Sealing these extraneous sources of leakage will also help keep incoming air entering through areas where you want it to come in. As a rule of thumb, a 2.42 square foot vent box opening will accommodate 1500 CFM of fan capacity. Insufficient static pressure will not allow the air to mix well and there will be stratification of warm air high and cold air low in the building. Optimal static pressure allows incoming air to mix and warm before reaching correct level. Too high of a static pressure may also cause the air not to mix well. Incoming fresh air may shoot along the ceiling and never mix well with the air already present. Remember, static pressure is not an indicator of how much air is entering the building, but only how much negative pressure the fans are creating as they pull air through the available inlets. In other words, it relates to the speed of incoming air, but not directly to the volume. Fan capacity dictates volume. As more fans turn on, larger openings are therefore needed to feed them to maintain the correct static pressure. An understanding of the basic principle of static pressure is imperative to effectively take advantage of power ventilation. In livestock applications ventilating barns is necessary to reduce heat stress and resultant production loss. Combine exhaust fans with intake shutters and environmental controls to replenish, cool and refresh the air inside your dairy barn. 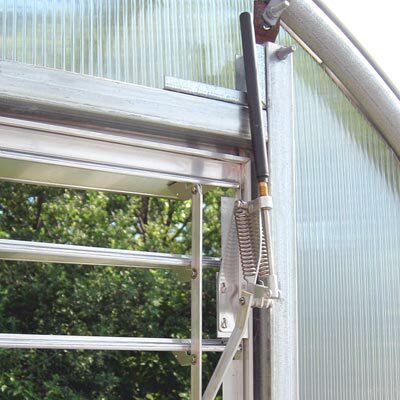 Air movement is important to plant growth within greenhouses. 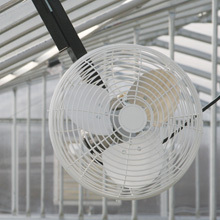 Continuous positive air movement within greenhouses equalizes temperature, carbon dioxide and humidity levels within the greenhouse. Plants use carbon dioxide in photosynthesis and release oxygen. Air circulation aids in the diffusion of CO2 into the plants. Through improved environmental conditions, healthier plants can be grown. The purposes of ventilation are to control high temperatures during the summer and to maintain relative humidity at acceptable levels during winter, to provide uniform airflow throughout the entire greenhouse, and to maintain acceptable levels of gas concentration in the greenhouse. Wind blowing into a fan's discharge reduces capacity and building ventilating rate. When possible locate low speed fans on the leeward side of the building. Exhaust fans and shutters work together to force outside air into the building. Exhaust fans are located on one end of a building. Air is drawn out of the building creating a negative pressure. An inlet (shutter) on the opposite end allows fresh air to come into the building, exhaust fans are used to provide sufficient airflow through the building. Because the air is warmed gradually as it passes through the building absorbing heat, the flow rate should be sufficient to hold this temperature rise to a minimum and be economically practical. Exhaust fans with shutters facilitate moving built up oxygen levels out of a greenhouse and bring in CO2. Exhaust fans aid in decreasing humidity. Fan systems can provide positive air movement through a building under all weather conditions. As the fans exhaust the heated air, a slight vacuum is created which draws in cooler outside air through louvers, open doors and cracks. For a given airflow rate and static pressure, a large diameter fan is more energy efficient than a smaller one. For a given ventilating rate and static pressure, one large fan is more energy efficient than several smaller ones. If two fans have the same blade diameter, the fan with the lower motor current input rating is usually more energy efficient. If two fans have the same static pressure capabilities, the one with the slower speed motor is usually quieter and more efficient. Use direct drive fans for variable speed applications. Limit the lowest speed setting to no less than 20% of maximum speed for proper bearing lubrication (or no less than 50% for cold weather ventilation). The speed controller must provide sufficient voltage to start the motor under load at low speed settings. Set the lowest speed to provide sufficient airflow to prevent the motor from overheating or to prevent freeze up in winter due to condensation and frost formation. Protect fans from wind gusts. Wind can stop fans running at low speed. Plastic exhaust fans are corrosion resistant and are used in hog and poultry facilities. 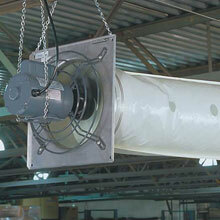 Slant wall exhaust fans are used in poultry operations and larger warehouses. These fans are quieter than other models. Solar vent openers will activate at a preset temperature, opening louvers. Plastic Hoods for Exhaust Fans protect fans from snow, wind and sleet during winter. They can be used on fans facing the north side of the building. 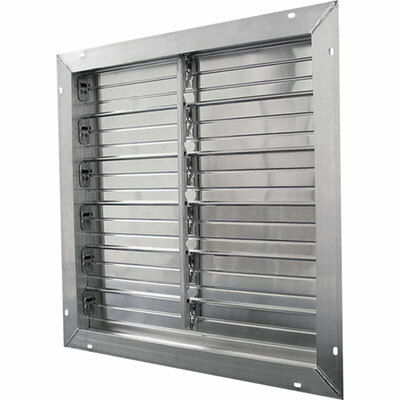 Poly exhaust shutters are corrosion resistant and are used in hog and poultry facilities and can be used with the plastic flush mount or fiberglass exhaust fans. 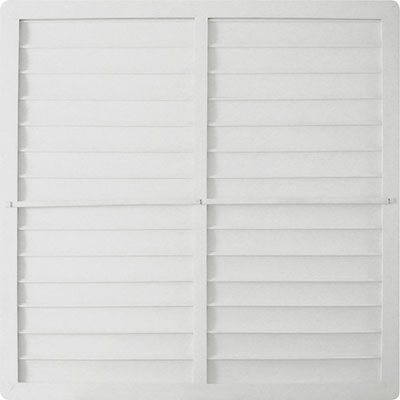 Aluminum shutters can be purchased with or without a motor. 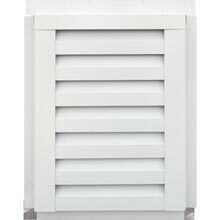 Motorized shutters can be used as air intake or air exhaust. Motor can be wired to a control such as a thermostat or timer. 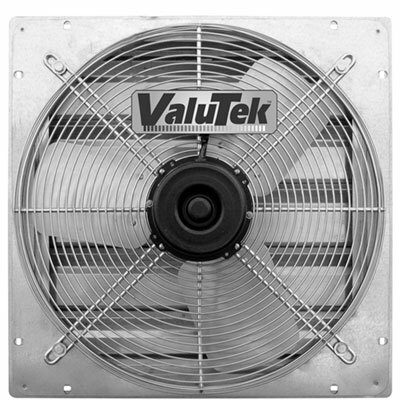 Smaller exhaust fans are used in smaller livestock facilities, warehouses and greenhouses. Depending on your location and building design, air circulation may be another vital component of your environmental control system. Mount the circulation fans to rafters, posts, or hang them from the ceiling to create a horizontal airflow to mix, temper and refresh all areas of the building. The purpose of these fans is to circulate and move air within a building. In a heated greenhouse, without a fan, temperatures increase 1 degree each foot above the floor. For example if a thermometer reads 60° on a four foot bench, then the temperature on the floor is 56° while the temperature at the ridge, depending on height, can be 70° Without a fan to circulate the air, in cold months the thermostat would have to be set higher to keep plants on the bench warm enough while the warm air is wasted above. Fans control insects and harden plants. Using larger fans with smaller motors can save energy. 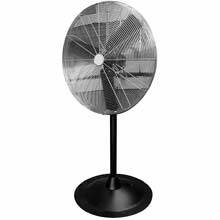 For example, a 36" diameter fan with a 1/3 horsepower motor will give the same output as a 30" fan with a ½ horsepower motor with a saving in electricity of 180 watts/hr. Reduce summer fan operation time by applying shading to the outside of the greenhouse. These basket-style fans are placed in a racetrack pattern to gently move the air throughout the building, helping to maintain a constant temperature. Use in greenhouse, livestock or warehouse facilities and mount on the ceiling (overhead joist) or high on wall. 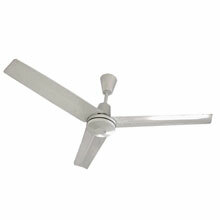 Ceiling fans are used primarily in warehouses and factories. Air in a typical factory can rise in temperature by two degrees per foot from the floor level. This means that the temperature at the ceiling of an industrial building at 20 feet in height could be over 100 degrees. Ceiling fans re-circulate the air, blending the warm air at the ceiling with the cooler air at lower levels. Using these fans during the winter can significantly reduce heating costs. Used with evaporative cooling in the summertime, ceiling fans create the wind chill effect which can make workers feel much cooler. Another advantage to ceiling fans is that they are up and out of the way, not interfering with operations or taking up space. Fans will be spaced in 5 rows with 11 fans per row for a total of 55 fans. Standard-duty units have a curved tip blade, provide good performance and use ball-bearing motors. The blades of high-performance units move more air directly beneath fans at a higher velocity which provides better cooling. It is recommended to use these fans in buildings where the ceiling is at least 20 feet high. Controllers are required when installing ceiling fans, and will allow fans to run at variable speeds or forward and reverse. Please note that reversing fan direction is possible but not recommended at ceiling heights above 12 feet. Above 12 feet, to adequately push air down to the ground level, fans would have to run at full speed. Duct fans are used to exhaust odors and humidity as in a bathroom or to extract gases such as radon from basements or methane from sewer lines or manure pits. 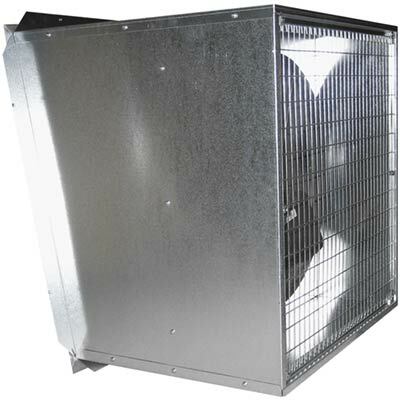 Below is a listing of products that are commonly used for commercial, industrial, agricultural and livestock cooling and ventilation applications. These products will help keep your building, warehouse, barn, animal housing, horse arena, agricultural building or greenhouse cool with the proper circulation of exhaust fans. Built to handle maximum floor area in high moisture applications, TekSupply's heavy-duty high-performance ceiling fans are great for winter heating or summer cooling and eliminate condensation. Ceiling fans help to deliver maximum airflow over wide areas. To maintain a healthy environment and keep people and livestock from overheating during the warm summer months, we recommend our circulation fans, misting and fogging systems, as well as air coolers. Put air cooling and circulation where you need it most. Our high-quality portable fans can easily be moved from one location to another. We also carry all the parts to complete your cooling system, such as shutters, vents, louvers, temperature sensors, thermometers, evaporative coolers and humidifiers. AquaCool: AquaCool System components are available for plant watering, animal fogging and workspace cooling. Choose the system that best fits your watering and cooling needs or build your own system using our large assortment of AquaCool accessories and plumbing supplies. Ceiling Fans: Ceiling fans are built to handle maximum floor area in high moisture applications. Our heavy-duty high performance ceiling fans are great for winter heating or summer cooling and eliminate condensation. Ceiling fans help to deliver maximum airflow over wide areas. Circulation Fans: Circulation fans can be used to keep your plants and animals safe from overheating during the warm summer months. High efficiency air circulating fans quietly cool your livestock. They are also ideal for industrial and warehouse facilities. Duct Fans: Duct fans provide proper airflow and circulation. They are typically used for intermittent applications and are often used for radon gas migration. Evaporative Coolers: Evaporative Coolers are powerful, compact and affordable. They ensure hours of cooling comfort by converting hot air into a cool breeze by using the process of evaporating water. Exhaust Fans: Exhaust fans are designed to draw air out of a building or structure. Fan Accessories: Fan Accessories are designed to keep air systems working properly and to their full potential. We offer a complete selection of fan motors, vent tubing and accessories, replacement blades, belts, fan covers and fan cooler kits. Fan Coolers: Fan Coolers are an economical way to cool both large and small areas and are available in wall mount, ceiling mount, oscillating pedestal and box styles. 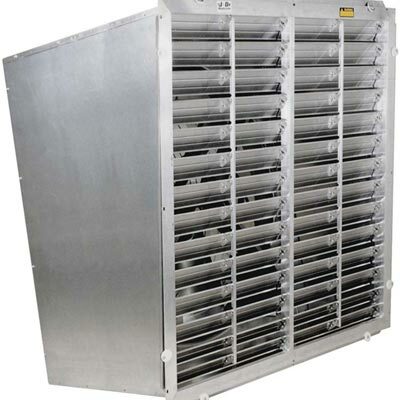 Choose either low/medium pressure or powerful high pressure coolers. A fine spray of water combines with the air movement of the fan to reduce temperatures up to 25 degrees. They are ideal for all agricultural, horticultural, commercial and industrial applications and will provide fast relief for your poultry, livestock or workers. Fan coolers may also be used for sports sidelines, training areas, camping and recreation sites, outdoor decks, patios and pools as well as amusement parks and concert events. Humidifiers: Humidifiers work to increase comfort levels and maintain healthy levels of relative humidity, while decreasing levels of bacteria, fungus, viruses and mites. They are corrosion resistant and are ideal for greenhouses, propagation areas, orchid cultivation, vegetable and fruit mills, egg rooms, hatcheries, poultry farms, pig pens, mills, factories and industrial plants. Humidistats & Dehumidistats: Humidistats work to control humidification equipment and effectively manage humidity levels while Dehumidistats provide low voltage control for dehumidifiers in heating and cooling systems. Shutters, Vents, Louvers: Shutters are an effective seal against outside air when closed and are used for inlet and outlet venting applications, while vents help to reduce condensation and improve airflow within a structure. Louvers are vertical or horizontal slats within a frame. They can be angled to allow air and light to penetrate a building. Thermostats: Thermostats regulate the temperature of heating, cooling and ventilation systems to ensure that the set temperature remains steady and consistent. Controllers are compact environmental control devices that are used to manually or automatically manage fans, heaters and ventilation equipment in livestock barns, greenhouses and industrial applications. They are available in a variety of styles to suit specific applications and many are specifically designed for use in corrosive and moisture prone environments. Tube Fans: Tube fans, sometimes referred to as wall hanging circulators, are perfect for vent tubes and metal ducts. I have some questions about your cooling and ventilation products. How can I get the answers that I need before placing an order? If you have any questions or require assistance with designing a cooling and ventilation system to meet your needs please use Live Help or Contact Us.